A stake in the AT&T tower (up to 90 percent) is being offered for sale. 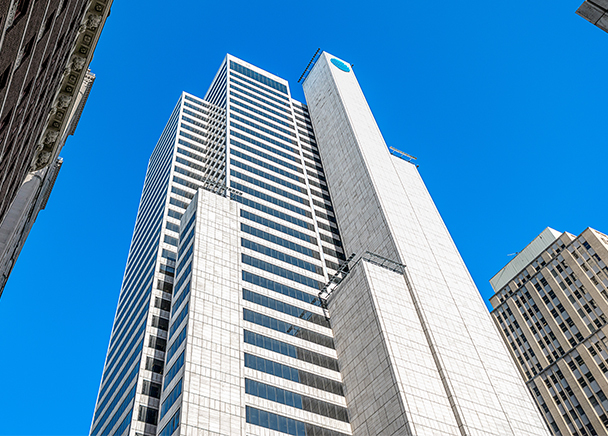 DALLAS – (Realty News Report) – The investors who bought downtown Dallas’ 37-story AT&T Plaza last summer are offering to sell up to a 90 percent stake in the building, according to CBRE’s John Alvarado. The 935,000-SF building is leased to AT&T until 2031, reports Steve Brown of the Dallas Morning News. It has been AT&T’s world headquarters since 2008. Dundon Capital Partners and Woods Capital bought the building, 208 S. Akard St. at Commerce Street, from a Carl Icahn group for about $250 million. AT&T is spending $100 million to upgrade its four-block campus. Upon completion, several city blocks will be converted to pedestrian-only access and numerous neighborhood amenities will be added including 40,000 square feet of restaurant and retail space, a proposed 2-story food hall with balcony dining, outdoor gathering and performance areas, a water garden and a 6-story video wall facing Commerce.